This is kind of neat. 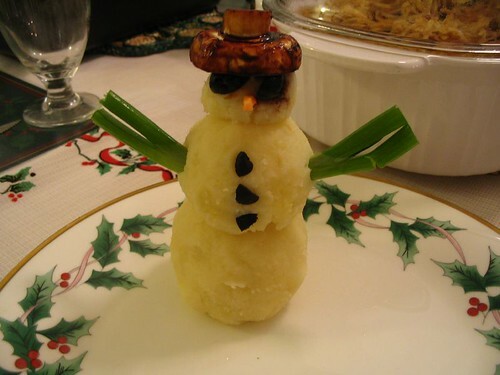 My mom made some snowmen out of . . . mashed potatoes. I like the arms of onion stalks. 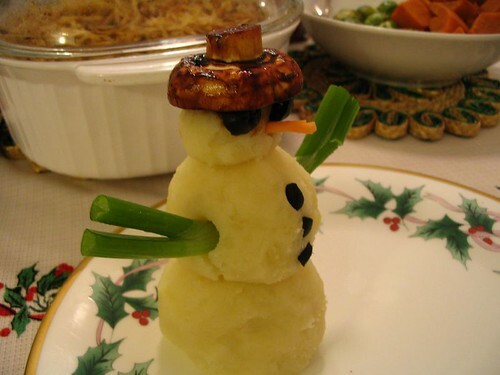 What sorts of food sculptures have you indulged in making / eating? posted by Jonathan at 12/25/2008 07:23:00 p.m.
My brother's favorite cake as a child was in the shape of a calculator. Nerdfest! Mine was a football (soccer) pitch. A triumph of optimism over reality there I think. By Thomas David Baker, at 12/26/2008 4:14 a.m.
By Jonathan, at 12/26/2008 12:22 p.m.